Already own a home in the Woodmont subdivision? Thinking of selling? Click here and read about current search trends & our web network. 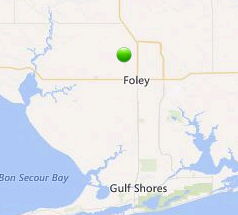 Woodmont subdivision is located in Foley, AL just North of the downtown area. Woodmont is a short drive to the restaurants, entertainment venues and shopping outlets in Foley and also near the Foley Beach Express. This expressway has just been finished (September 2014) and now connects Orange Beach to I-10 making transit much easier and quicker for the entire area. The expressway also makes trips to Pensacola and especially Mobile, AL much quicker. Both of these cities have regional airports and the numerous amenities one would expect from larger cities. Foley, AL has two golf courses with one of them being a smaller course and the other is Glen Lakes which has a great, links-style layout and is very close to Woodmont subdivision. Woodmont currently has numerous lots for sale for those interested in building their own home. Please email us at info@condoinvestment.com for additional sales info including recent sales figures for Woodmont, pictures, community bylaws and such. Give us a call at (251) Area-Pro (251-273-2776) to schedule appointments to view current listings in Woodmont or other area real estate and for immediate assistance. Woodmont subdivision is just north of downtown Foley and is close to many attractions including golf courses and the popular amusement park OWA. This neighborhood is an approximately 30 minute drive from Gulf Coast beaches using either the Foley Beach Express or Highway 59. If you are interested in learning more about Gulf Shores condos and Orange Beach condos, our site provides up-to-date listings, annual rental revenue information, and prices of recently sold properties as well as closed dates. Visitors can take advantage of helpful features such predefined searches, aerial imagery, and interactive maps to search for Perdido Key, FL condos for sale or other Alabama and Florida properties. We provide our users with annual rental revenue information to help buyers choose the best condo whether it's for a second home or investment purposes. Condoinvestment.com is updated every day with new listings and fresh content making it a popular resource for those looking to buy and sell real estate on the Gulf Coast. All of our web pages our adapted to fit the screens of mobile devices and feature easily navigable tool bars.